Uliana Dobrova is an art historian, critic and appraiser. 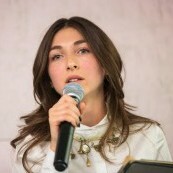 She is a graduate of Moscow State University’s history department, with a focus on Renaissance Art History. She leads the Art Appraisal team at Moscow’s Pavel Tretyakov Expert Organisation. She lectures regularly at the Art Management department of RMA, a Moscow-based business school. For the past five years she has also written extensively about Russian contemporary art.